This book arrived right on time. We had just purchased our first house in a quiet neighborhood. Our home is not the biggest on the block, but it's the first house our daughter will call home. It is also the first house me and my husband have had together. Even though I was so proud that we finally made it this far, all of a sudden, it wasn't good enough. I was apprehensive to invite people over. They already had houses, finely decorated houses at that. With the exception of our main living area, and our daughter's room, the rest of the house was pretty blah. We still had hand me down furniture and homemade decorations. The "Keeping Up With the Jones'" mentality hit me fast and hard. I was so excited to read this book. 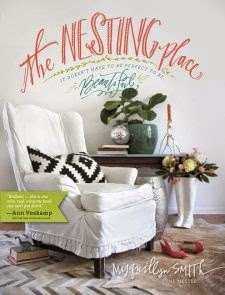 While combing Pinterest for decor ideas, I found Myquillyn Smith's blog, The Nesting Place and learned about her book, The Nesting Place: It Doesn’t Have to Be Perfect to Be Beautiful. It was a blessing. The book is divided into 13 chapters and several appendix's. Self-taught decorator, Smith shares her story of her homes throughout the years and how they were beautiful with the simple things. Along with the story are beautiful photographs worthy of a spread in a magazine. She shows the simplicity in how they were put together and the purpose they have in her home. The overall theme is that your home should be welcoming, comforting to your family and, of course, that "it doesn't have to be perfect to be beautiful." Needless to say, after reading a book like this, I was convicted to not buy items just for the sake of filling the empty spaces in our home or sterile perfection in decor. Each item should have a story and purpose and I will enjoy the journey in filling those spaces over time. This is definitely a book I will reread often.